Dubai: Additional signs of biting US sanctions on the Iranian economy will start to appear this year, economists and researchers have said. Tens of thousands of jobs are expected to be lost, and all economic sectors that are engaged with foreign investments, including the automobile industry, will bear the brunt of the American sanctions, which went into effect late last year, they explained. “We don’t have obviously 100 per cent accurate statistics, as the [US] sanctions were imposed last November, but a lot of anecdotal and indicative reports suggest there are going to be significant job losses in a number of industries, particularly the automobiles sector,” said Sanam Vakil, senior consulting research fellow in the Middle East and North Africa programme at London-based think tank Chatham House. Job losses would be across several sectors, Vakil said in an interview with Gulf News. According to the Statistical Centre of Iran, which is the official Iranian body authorised to collect data and implement surveys and censuses, the unemployment rate reached 12.10 per cent in March 2018, up from 11.9 per cent in December 2017. It is estimated that the combined percentage rates of unemployment and underemployment in many non-industrialised countries is 30 per cent. In the developed countries those rates range between 4 per cent and 12 per cent. Iran’s services sector is the largest employer, representing 50.4 per cent of the total employment in the country, followed by the manufacturing sector (32 per cent) and agriculture (17.6 per cent), according to the Iranian Centre. Iran’s population stood at 81.10 million people in March 2018, according to official statistics. Due to population growth, some estimates put the number of people who enter the country’s job market every year at nearly one million people. Economists cautioned that the rate of job creation is “well below” the level of people who are joining the labour force. “The absolute number of people who are unemployed is growing every year, and one of the ways of dealing with that is to attract large scale foreign investments to create jobs. Now that won’t happen and indeed, that level of investing is dropping as European companies are withdrawing out of the country. So yes, we will see unemployment rise for sure,” said Nicholas Fitzroy, Risk Briefing Director and Middle East analyst at the Economist Intelligence Unit in an interview with Gulf News. Fitzroy said it is “too early” to have data on the impact of the US sanctions on Iran. However, oil exports constitute the key figure that can be trusted at the moment that has impact on economic growth in a country that has inflation estimated at 40 per cent. The absolute number of people who are unemployed is growing every year, and one of the ways of dealing with that is to attract large scale foreign investments to create jobs. Now that won’t happen. 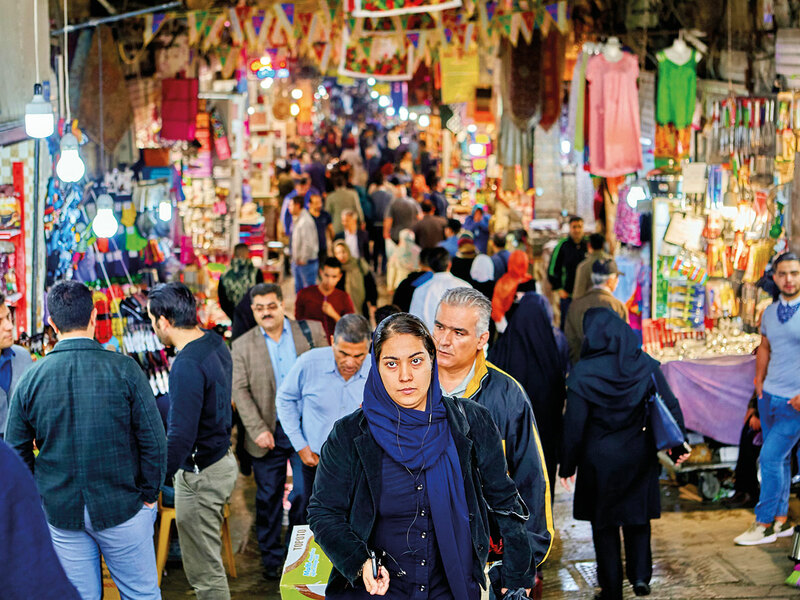 “I don’t think the [Iranian] economy will collapse, I just think what we will see in the next year or two the economy contracting relatively sharply — a relatively deeper recession,” Fitzroy said. “I think in the next year or two, we will have 3 or 4 per cent contraction, and maybe more, then it will start to resettle, with some foreign investors from China or India working out ways to circumvent the US sanctions,” he said. The economy will resettle but only after a deep recession, he added. Other economists said that the International Monetary Fund (IMF) has already predicted that the Iranian economy will contract 1.5 per cent in 2018 and 3.6 per cent in 2019, said Lukman Otunuga, analyst at FXTN, a Global foreign exchange broker. He told Gulf News that a weaker Iranian currency is among the main concerns, which is a main factor for inflation. Oil-rich Iran has been under a series of economic sanctions since 1979. The country has been under two rounds of sanctions in the past 12 years. The first was in 2006 and the second in late 2018. “Last time, all the countries were against Iran. All governments and [foreign] private companies couldn’t do business [with Iran]. This time, the private sector is choosing not to do business,” Vakil said, in reference to the fear among different economic circles of the American threats of imposing sanctions on companies dealing with Iran. “All the multinational companies have made the decision that the American economy is much more important for their business than the Iranian economy,” she said. In 2006, the UN Security Council imposed international economic sanctions on Iran in a unanimously adopted Resolution 1737, for failure to halt its uranium enrichment programme. They were lifted on January 2016 after a nuclear deal was reached between Tehran and the five members of the Security Council members plus Germany. However, US president Donald Trump withdrew from the agreement in May 2018, and imposed economic sanctions on Iran that came went into effect last November 2018 to force Iran to change its regional policies, which include supporting militia groups and the development of ballistic missiles. Currently, Iran is taking the position of “wait and see” for the outcome of the 2020 Presidential elections, said Sanam Vakil, a research fellow at Chatham House. “I think they are very much looking at the forthcoming US elections of 2020 as a parameter for their ability to survive during this period,” she said. After the American sanctions came into effect, Iran’s oil exports dropped from 2.4 million barrel a day to nearly 1.4 million barrel a day at present. The almost 50 per cent drop would have “a massive impact on the Iranian economy”, said Nicholas Fitzroy, of the Economist Intelligence Unit. The US, when it imposed its economic sanctions on Iran, gave a temporary waiver to eight customers to keep buying crude from the Islamic Republic: China, India, Japan, South Korea, Italy, Greece, Taiwan and Turkey.